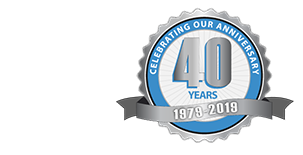 The talented team of garage specialists at Blue Sky Builders has been providing dream garages to clients across Illinois for over 30 years. Are you ready to get started on your next garage project? Even small updates can help increase your garage’s functionality and boost your property value. Realtors estimate that adding a two-car garage to your home can increase your home’s market value by thousands of dollars. Contact our team today to learn more about the wide variety of garage services we offer including custom garage design, unique customization opportunities, renovations, and more. Thanks to our cost effective services and financing options, the perfect garage may be closer than you think. For this week’s blog, however, we are exploring a few garages that most of us can only drool over. Check out some of America’s weirdest, wildest, and most expensive dream garages. Part of a massive five acre, 35,000 estate, the garage of Mockingbird Lane in Paradise Valley, Arizona, is one that will make classic car enthusiasts swoon. 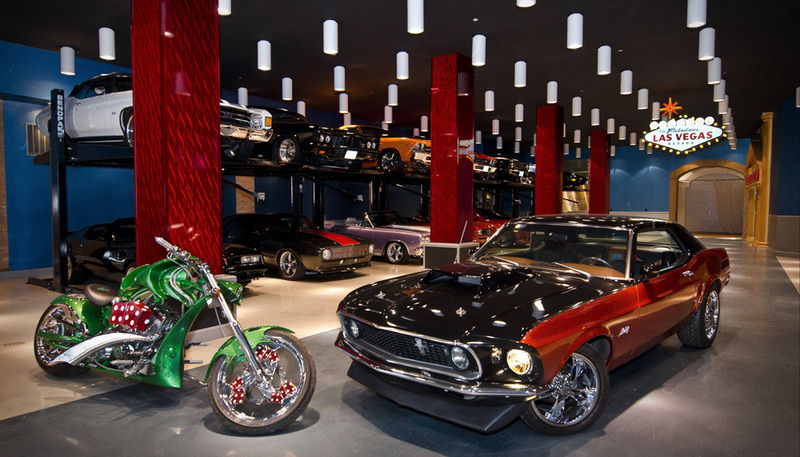 The garage houses 20 vehicles and features a “show garage” that cost $400,000 to complete. To complete the classic look, the garage has a 1950’s style checkered floor, antique gas pumps, art-deco style columns and great lighting. The next garage on our list is an amazing home to a collection of vintage, collector automobiles. Located on Echo Peak Lane in Las Vegas, this eight-car garage, attached to an $8.75 million dollar property, features hardwood flooring, flat screen televisions, and a chandelier hanging from the ceiling. On top of all its luxury touches, the garage is also temperature controlled, a valuable tool that helps protect vintage cars from things like rust, mildew, and fading over time. This lavish property also features four gates allowing entry to the property, providing maximum security. Do you like showing off your vehicles? If so, this Paradise Valley garage will be right up your alley. Attached to a luxurious $10 million dollar home, this 15-car temperature controlled garage features a “show garage” built specifically to house four vehicles simply to show them off. The garage also features a 60-foot garage built to store RVs. When venture capitalist Francis Wisniewski decided to build a new garage, he wanted to bring a little Las Vegas magic to his lavish property near Chicago, Illinois. This 15,000 square foot dream garage is a little slice of Vegas, complete with a “Welcome to Las Vegas” sign, a gambling room, a full size craps table, a basketball court, and more. Every vehicle is stored on lifts to save space. The project took over 18 months to finish and cost over $1 million dollars. Our final choice may take the cake as the biggest and most lavish garage. Milt’s Steel Horse Ranch, located in rural Georgia, was originally a barn for horses that has been transformed into a spectacular garage. 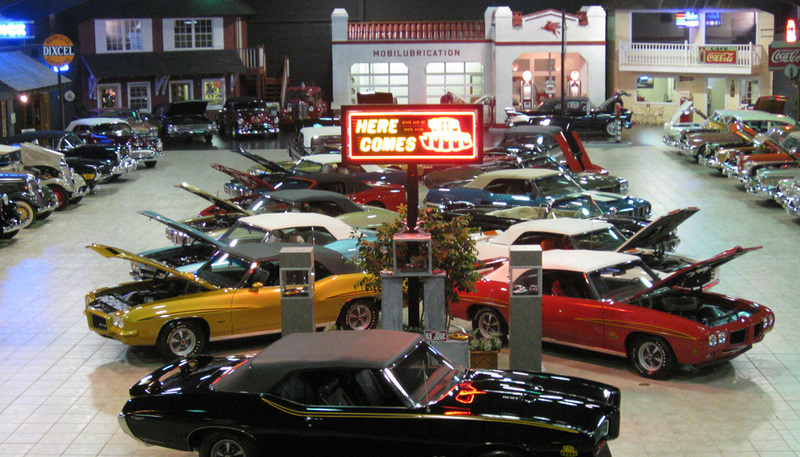 The 26,000 square foot structure now houses a large collection of vintage, sought-after muscle cars. It also has a small town America feel complete with a barbershop, diner, and salon all within the garage. 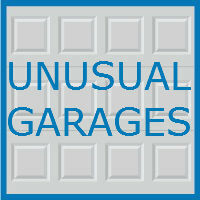 What do you think of our list of wild garages? Are you ready to get started building your dream garage? While the garages on our list might be a little be out of most people’s price ranges, we at Blue Sky Builders are proud to offer quality, affordable services that everyone can enjoy. Call 630-852-8485 or visit Blue Sky Builders online to learn more today.